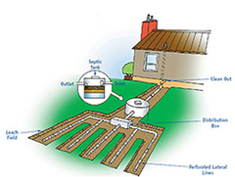 There are many different types of septic tank systems to fit a wide range of soil and site conditions. A properly maintained septic system will provide effective long-term treatment of household wastewater but a malfunctioning system can quickly become a costly and potentially litigious problem. Practice water conservation: The more water that enters your septic system, the more work it has to do and the harder it will be for the system to keep up. To conserve water take short showers instead of baths and avoid running dish- or clothes washing machines unless they are full. Inspect your system once a year: Frequent inspections are the best way to keep your septic system operating properly. Problems rarely become obvious immediately which means that by the time you notice something is wrong, it is likely a larger problem than you think it is. Avoid legal and health troubles by having your system inspected regularly to ensure you catch any issues before they become a large problem. Keep accurate records: After each inspection, compare the results with those of the previous year to keep track of any potentially dangerous trends that you should keep an eye on. Pump out your septic tank as needed: Inspections will help you gauge when pumping is necessary and keeping records will help you establish a schedule. This will also help you keep an eye on water consumption habits around your home and let you know if you are creating more wastewater than in previous years. Never flush harmful materials: Your septic system relies on a delicate biological treatment process which can be interrupted or destroyed by the introduction of the wrong kind of chemicals or waste products. Remember never to flush anything that may clog the pipes or interfere with the biological balance in your septic tank. Avoid harsh chemicals whenever possible and stagger cleaning of bathrooms and kitchens to avoid allowing too many cleaning chemicals to enter the tank at once. Keep runoff away from your system: When designed a septic system or nearby drainage systems, make sure there is enough room between them to prevent your drainfield from becoming flooded. If there is too much groundwater in the drainfield it will not function properly and unprocessed wastewater could rise to the surface. Protect your system from damage: Never drive or park above any part of your septic system including the drainfield. Compression of the soil will interfere with the treatment process and has the potential to damage the tank or connecting pipes. Landscape properly: Keep large trees and shrubs with expansion root systems far away from your drainfield and tank. Roots are the number one enemy of underground plumbing as they can easily work their way into pipes and other places they should not be. If you septic system begins exhibiting any of these signs, call us right away to book your inspection!